As math is the universal language, soccer is the universal sport. With the World Cup only days away and the world itching for any futbol-related media, This Is Not a Ball couldn’t have dropped at a better time. The film’s beautifully shot, as evidenced by the opening sequence. 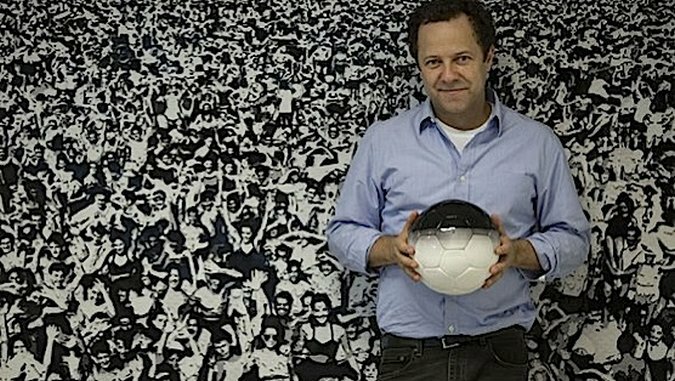 Brazilian artist Vik Muniz walks in Estadio Aztecha, holding a soccer ball. He’s smartly filmed from below, the bleachers dwarfing him. His plan is to build an art installation in the middle of the stadium using nothing but 10,000 soccer balls and as many gallons of sweat. Everything about the film screams of ambition, from Muniz’s artistic goals to the promise that the viewer’s in for an exploration of why soccer is the most beloved sport worldwide. “Why is this the global game?” Muniz asks. After all, as the film states, more than 700 million people watched the 2010 South Africa World Cup Final while only 100 million watched the same year’s Super Bowl—that’s not even accounting for many caught willingly for commercials and unwillingly at parties. Sadly, that ambition overwhelms the film the way a strong team might a weaker one after its star player is given a red card. The viewer is taken on a trip around the world as diverse as the teams vying for the World Cup, but the stories aren’t cohesive. When Muniz’s artistic ambitions are finally realized in the film, gorgeous as they may be, the viewer is rubbing his neck from the whiplash of jumping between what feels like two films. There are dual storylines: that of Muniz creating his artwork and his investigation of why people love the sport. The actual soccer ball, both physically and symbolically, is where the two storylines are supposed to dovetail. But they end up feeling uneven, a seesaw with the weight of poverty, sexism and amputation on one end and the excitement of creating great art on the other. The film works in segregated sections, and the first twenty minutes—save for an odd appearance by superstar astrophysicist Neil deGrass Tyson, whose appearance later in the film continues to confound—focus on soccer bringing people out of underprivileged situations of one stripe or another. From a drug trafficker-turned-soccer coach to the rags-to-riches professional player, Marta Vieira de Silva, our hearts are kicked around much like the ball we’re exploring. At first, the film’s main object feels like a Trojan Soccer Ball, bringing us into the heart-wrenching stories of the places where soccer is so beloved (and potentially more universal than a nutritious meal). We explore Rio de Janeiro and Mexico City. We see brilliantly colored graffiti and children clothed in dirt and rags. For all the stories of hardship, the most affecting moment of the film comes in the form of homemade balls, much like the ones professional soccer player Marta Vieira da Silva describes using when she was young. One ball is a burlap sack tied into a spherical shape by fraying twine. Another is a literal ball of trash. That ball feels like a symbol of the love the world has for soccer, regardless of circumstance. Geovane Lopes climbed his way out of the drug trade, and his reward is a smaller paycheck and the chance to play dirt-clad soccer with other kids escaping a hard life. Already battling poverty, da Silva faced schoolyard sexism growing up. She describes only kicking the ball when it comes near her. Now, a thousand lights highlight her racing form as she dribbles the ball, a real ball, down the pitch. But that viewer is jarred out of that story into the one Muniz seems more interested in portraying. Jarring is best way to describe cuts like the one around the twentieth minute, from poor children finding in soccer a brief solace from a crushingly difficult life to developmental psychologist Edith Ackerman explaining why Muniz’s daughter enjoys kicking around a ball. The discussion of object permanency doesn’t really seem to fit the film, which begins losing steam as we learn of Muniz’s artist ambitions with random asides, e.g., Neil deGrasse Tyson discussing the transfer of energy that would occur if one dropped several soccer balls from a helicopter, bouncing one on another, before he chats about the strength of human ball joints. It’s interesting stuff but feels like a different film entirely than the one promised in the outstanding opening twenty minutes. At that point, we’re in for a back and forth between the two story lines. That kind of back and forth that might feel interesting in a soccer match, but watching the two types of stories compete for screen time exhausts the viewer. After watching the soccer balls hand sewn in Pakistan by local men and women, who are separated into different rooms and don’t wish the same life for their children, an argument about restarting the art installation feels not only flatter than a deflated soccer ball but painfully self-indulgent. That argument is followed by a fascinating exploration into the Burmese art-sport Chinlone. It’s both touching and gorgeous, as we witness players in Myanmar move the ball around as extensions of their own bodies. That sequence—and later, the one on the Sierra Leone amputee soccer team—fit with the first twenty minutes of the film. Tied together, they would create a fantastic look at why the soccer ball matters so much to so many. But intercut with shots of the art installation and interviews with deGrass Tyson on the physics of the sport, it feels like you’re watching two different documentaries. One of them is powerful. One of them is pompous. And the latter lessens the impact of the former. When we finally view the installation, yes, it’s beautiful—and must have been breathtaking from the helicopter from which the crew shot. But it leaves the viewer wondering if the money spent on an enormous art installation couldn’t have been used somewhere else. In the film’s defense, those balls are now tools for change. That reality, though, doesn’t matter when the film leaves its viewer arbitrarily vacillating between emotions. Still, there is a fantastic documentary within This Is Not a Ball, begging to burst onto the screen. As a result, the film is worth it for the touching moments, though more fully realized explorations on poverty and the means of escape it already exist.